these pictures are from when i was in new york last month, but i recreate this outfit probably once a week. 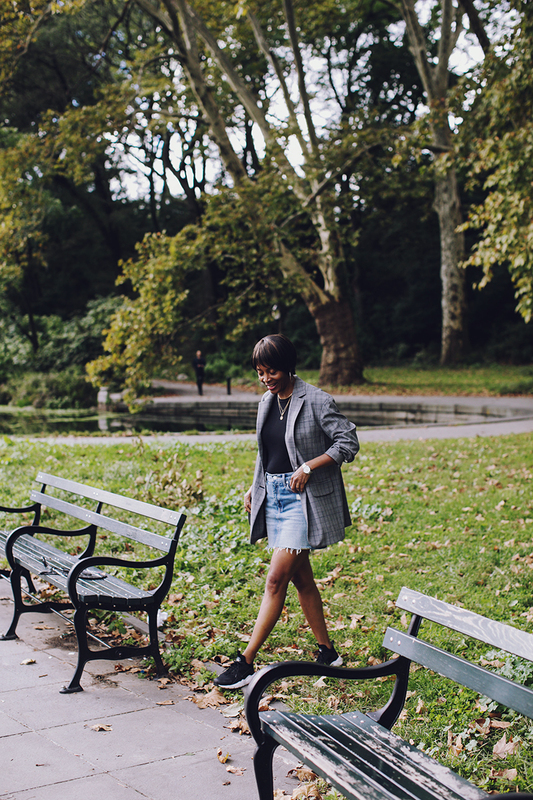 blazer + t-shirt + mini + sneakers/flats + cross body, rinse, repeat. it’s a look that makes me feel pulled together but also not like i’m trying too hard, and is good for work or weekend. 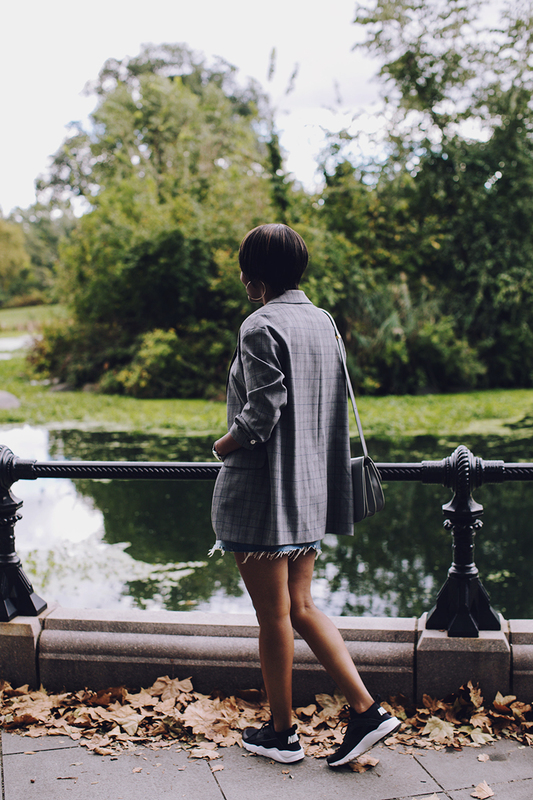 i’m partial to this tibi plaid blazer (previously seen here) because the oversized fit allows me to play with proportion, but a long cardigan (like this or this) or a regular blazer will work too. a denim mini, especially this one with the frayed hem feels more casual; a leather mini takes it up a notch. finally for the footwear, i’ve been living in my nike air huarache’s, my way to do the “dad sneaker” trend. i just ordered a pair of nike air max 270 to mix in but it also looks chic with vans or chuck’s. also today’s is giving tuesday, a chance to shop while giving back. 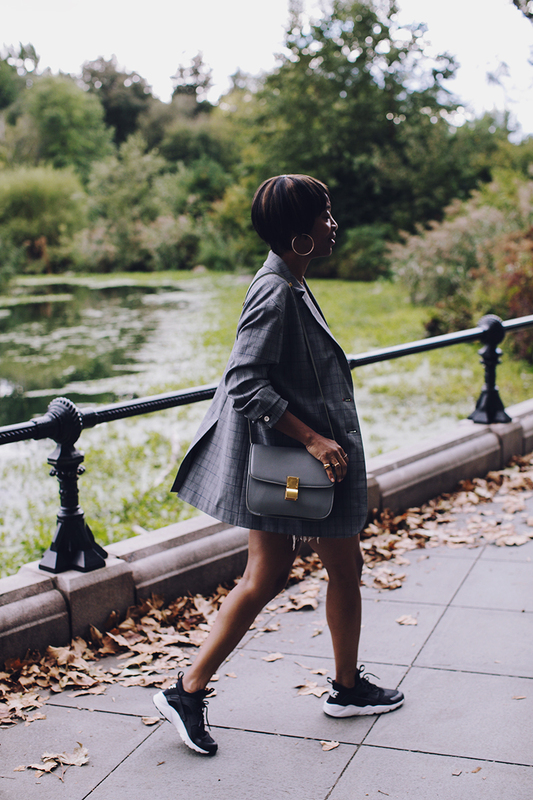 some of my favorite brands have deals today and throughout the week like amour vert (plus 15% off silk today), soko (25% off the charity: water collection, percentage of proceeds go to getting communities access to clean water), rag & bone (20% off your purchase when you donate a gently worn coat), and j. crew’s garments for good (100% of proceeds benefits girls inc., human rights campaign or charity: water). are there charities or brands that you are passionate about working to give back this holiday? i’d love to hear about them! Previous Post shop small holiday: saturday and cyber deals. Next Post innerwear as outerwear.